With Indra P Nooyi having announced she is stepping down as PepsiCo CEO, the number will now go down to 23. IN THE one year between the Fortune 500 lists for 2017 and 2018, the number of women among the CEOs of these 500 companies dropped from an all-time high of 32 to 24, or by 1/4th. Although this year’s list shows 25 women CEOs (25%) in the top 500, Campbell Soup CEO Denise Morrison retired at the time the list went to print, Fortune clarifies in an article. With Indra P Nooyi having announced she is stepping down as PepsiCo CEO, the number will now go down to 23. 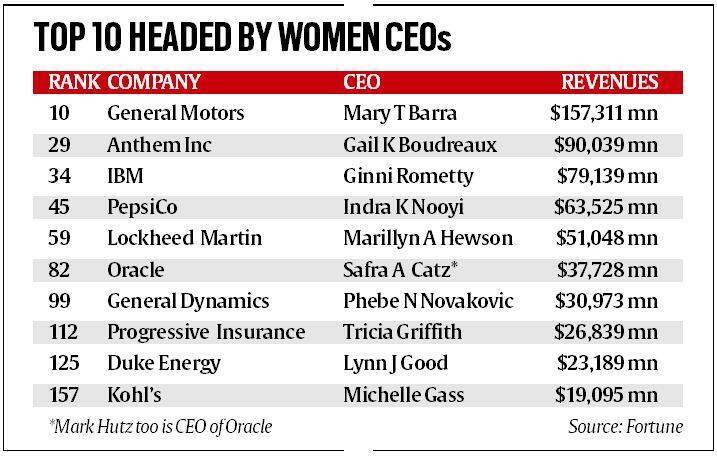 Out of last year’s 32 women CEOs, over one-third (12) have since left their jobs, not counting Nooyi. Besides Campbell, these are Meg Whitman (Hewlett Packard), Irene Rosenfeld (Mondelez), Sheri McCoy (Avon), Shari Goodman (Staples), Margo Georgiadis (Mattel), Marissa Mayer (Yahoo), Kim Lubel (CST Brands), Jackie Hinman (CH2M Hill), Ilene Gordon (Ingredion), Debra Reed (Sempra Energy), and Debra Crew (Reynolds American). This year’s list has four newcomers among women CEOs: Ulta Beauty’s Mary Dillon, Kohl’s Michelle Gass, Yum China’s Joey Wat, and Anthem’s Gail Boudreaux.